Jade aka Champion Avalon's Crystal Blue is blue in color and sired by Champion Avalon's Dark'N Dashing and out of Pinafore Peach Cobbler. Jade has a wonderful outgoing personality. She is a crowd pleaser with perfect poodle manners. Jade was shown to her championship by Terri Meyers with an assist from Susie Kipp and Bobby Kopps. 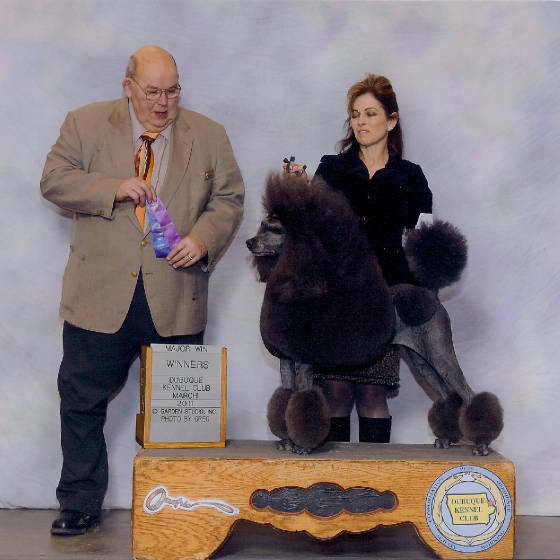 Jade can produce a rainbow of poodle colors including black, brown, blue, white and silver depending on who sires her babies. She is 42 lbs and 23 inches at the shoulder.